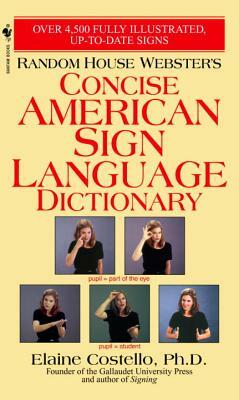 From basic hand shapes to fully illustrated and described signs, Random House Webster’s Concise American Sign Language Dictionary offers a comprehensive and up-to-date treasury of signs. Whether you are a novice seeking “survival signs” for basic communication or an experienced user fluent in ASL and looking to enlarge your vocabulary, you cannot find a more complete, easy-to-use sign language dictionary. Elaine Costello, PhD, was a longtime educator and author in the field of deafness. For ten years she was a classroom teacher and supervisor in schools for the deaf. She also served as the director and editor in chief of the Gallaudet College Press at Gallaudet College in Washington, D.C., the world's only liberal arts college for the deaf.